The 15 Most Romantic Places in Michigan! Michigan is for lovers, too! Don't believe me? Explore our state sometime in February and see how fast you're cuddling up in front of a fire! It's not just the bone-cracking cold that makes Michigan very friendly for lovers, though, as the state's superabundance of natural beauty also tends to make the eye grow misty and the heart go wistful. Grab that special someone, pack a bag, and enjoy these 15 romantic spots in Michigan. Mackinac Island is home to the Grand Hotel, which is by itself a center of romance and history in the state. Beyond this classic, however, the whole island features long sandy beaches to walk at sunset, quaint shops to explore on foot, and about 30 percent of the state's known supply of fudge. Chocolate has a romance all its own, and man, does Mackinac Island have it. When “Good Morning America” is ready to call this the most beautiful place in the United States—as it did not so long ago—the end result is romance, ready to go. 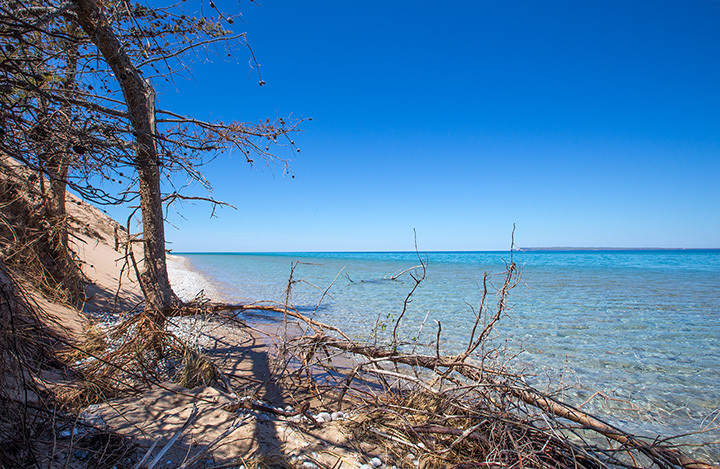 With Lake Michigan's scenic splendor not far away, and the accompanying sunset-on-water effect ready to go, Sleeping Bear Dunes can make for a seemingly endless walk on the beach. That's hard to pass up for anyone looking for romance. The stunning rugged beauty of Pictured Rocks is truly a sight to see and it's the perfect place to bring that special someone. Woods, water, sheer cliffs that stretch for miles, and you at the very center of it all...it's enough to give you that sense of perfect privacy that allows for near-total focus on a loved one. An ideal setting for romantic adventure. The entire city of Grand Haven makes for an excellent romantic getaway owing in large part to its variety of options. Naturally, it's got the lakeshore, which delivers top-notch sunsets as well as beaches to walk, but it's also got plenty of restaurants, recreational events and facilities, as well as lighthouses, which add an extra note of the picturesque. If it feels a little unreal, it probably should, and that unreality lends itself well to those of a romantic bent. Near Interlochen, the Lake 'n' Pines Lodge delivers romance in a fashion few have been able to imitate. Not only will they offer an exciting dinner for two package, but upon returning to your room there, a bottle of wine and a sweet-and-salty snack package will be waiting. The next day, they'll even throw in breakfast, making this a complete romance from start to finish. You will find romance in the Marv Herzog Hotel. Specifically decorated like an alpine lodge, coupling that on to Michigan's appropriately alpine winter temperatures makes you feel like stepping right into the Bavarian Alps. Throw in free deluxe hot breakfast and a free daily reception featuring beer, wine, soft drinks and even snacks, this is one romance that won't weigh heavy on your heart or your wallet. It's hard to deny the romance of nature, and it's even better when you can get access to tropical plants and similarly-heated surroundings in the midst of winter. That's positively tailor-made for romantic situations, and Grand Rapids' Frederik Meijer Gardens will provide it in spades. Throw in plenty of outdoor activity as well, and you'll have a romantic destination just made for long slow walks in the best of flowers Michigan can offer. Stop in to Kalamazoo to get a look at Henderson Castle, which actually looks somewhat like a castle in its own right, but delivers romance both inside and out. Offering not only exciting visuals, the Henderson Castle's bed-and-breakfast options start with romantic dinners for two—full-on French cuisine, no less—and segue into some impressive spa options that ensure you're relaxed, well-fed, and happy. Few better recipes for romance exist. That might sound like a ludicrous proposition in terms of romance, but McMillan's Nature's Kennel has one particular plus going for it in the romance department. Nature's Kennel offers a complete seminar on dog sled driving. You'll not only learn how to drive a dog team and care for the dogs in question, but you'll also be set loose to spend a night camping in a tent heated by a wood stove. Think about you and that special someone out in the depths of a Michigan night with nothing but you two and a wood stove around. Plus some dogs. A 1930's-style jazz club—complete with art deco interiors, easily one of the most distinctive of architectural styles—offers dancing to live jazz, which as we all know might be the most romantic form of music on Earth. Feel like you've traveled back to the 1930s—or at least the most romantic part of them—and enjoy the feeling accordingly. Head out to Allegan for this unexpected romantic treasure. Turns out that Kalamazoo isn't the only city in Michigan that boasts a castle, and Allegan's Castle in the Country will make impressive steps toward satisfying visitors. Take rooms with fireplaces and hot tubs, throw in a lake, a pond, and the “enchanted forest” for walking along with a slate of spa services, wine tasting getaway packages, and even complete meal services—a free breakfast is offered as part of the room, reports note, and both picnic lunches and dinner options are on hand to cover pretty much everything a romantic getaway needs. While Minnetonka Resort in Copper Harbor looks like the kind of motel that might involve a guy named Norman, there's a lot going on beneath the surface. Minnetonka Resort has a slate of motel rooms, which are about par for the course, but guests can also opt for one of the available guest cottages, where a variety of options await. Throw in free Wi-Fi, DirecTV, picnic tables and grills, and the sheer beauty of the Copper Harbor region and the end result is a package worth checking out. Did you know there are still drive-in movies showing in Michigan? While they're not always open all year—check your local listings for show times and hours—a drive-in movie can be the height of romance. Ford Drive-In in Dearborn represents one of the best such options. Head in for movies running potentially until close to sunrise, with double features on some of the biggest new releases. Relive that heady teenage romance by sitting in your car and watching movies with that someone special. Romance at a museum? That might sound crazy until you take a closer look at Flint's Sloan-Longway Planetarium. The idea of a starry sky available at most any time can be a downright thrill, but throw in the special exhibit running through May featuring artifacts from the Titanic, and you've got one killer romantic recipe afoot. Go from “I'll never let go” to watching the stars come out and discover that the museum can be a much more romantic date than you might expect. Dinner, if done properly, can be one of the most romantic outings there is. Throw in the fact that everybody's got to eat anyway and even the busiest of people can find a way to add this romantic touch to their lives. Troppo in Lansing features some absolutely breathtaking décor built around old fashioned supper clubs. Featuring such things as Italian marble and dark woods, the eyes are more than satisfied before the nose and stomach can even get involved. The mind-blowing dinner menu, meanwhile, will only top things off.